If you’re in a car accident, about the on your mind is litigation and insurance claims. Nonetheless, there is a statute of limitations on car accident claims that is set at four years (WY Stat § 1-3-105) and insurance claims should be made as soon as possible. The attorneys at the Olson Law Firm understand how stressful being in an accident can be. Not only are you facing an uncertain future medically, but there could be medical bills piling up, lost wages from missed work, and a considerable period of rehabilitation. Our job is to take some of the stress off of you and ensure that you get the compensation that you’re entitled to under the law. If you have injuries resulting from a car accident, involving an attorney early in the process is the best course of action. Give us a call or contact us online to set up a free consultation today. Wyoming is a tort state when it comes to car insurance. That means claims are filed against the other individual’s insurance policy and a determination is made as to who is at fault for the accident. The question of fault revolves around the question of negligence. Negligence, in this sense, can mean carelessness, recklessness, or the violation of any of the rules of traffic. When these actions result in injuries to another person, that individual is liable under the law. When you’re in a car accident, you can either file a claim with your own insurance company or with the other driver’s insurance company. If you file a claim with your own insurance company, your insurer will attempt to contact the other driver’s insurer. Based on the physical details concerning the collision, the police report, and any other data that can be gleaned, a determination will be made as to who is at fault. Sometimes this is straightforward and other times it is not. The insurance company representing the other driver has a fiduciary responsibility to act in the best interests of their client. In this case, the insurance company’s own interests are aligned with those of their policyholder. That is to say, they both want to see you paid as little money as humanly possible. The most common tactic they employ to do this is to exploit ambiguities in the reports and physical data against you in order to blame you for the accident. Other tactics include claiming your injuries are not as severe as you claim or that they were present before the accident happened. In order to deal with this, you will need the aid of an experienced Wyoming car accident attorney. In some cases, there are two drivers who each did something wrong and thus are both partly responsible for an accident. For instance, imagine that one individual is attempting to change lanes but does so abruptly and without the use of their blinker. Another driver, who is speeding in the other lane, fails to react in time causing a sideswipe accident. Since both individuals are partly to blame for the accident, each of them can be assigned some of the blame. In Wyoming, this is called comparative negligence or comparative fault. Either party may initiate a lawsuit but only if that party is no more than 50% responsible for the accident. In cases where both parties share some of the blame but one party is more responsible for the accident than the other, they will see their potential damages reduced in the amount of their own negligence. For instance, if one party sustained $100,000 worth of damages but is 30% responsible for the accident, then they can only collect 70% of $100,000 or $70,000. Today, distracted driving has become one of the most common reasons for major traffic accidents. With cell phones, infotainment systems, and other modern technology, more and more individuals are causing accidents by splitting their attention between their tech toys and the road. In addition to the modern causes of distracted driving, traditional forms such as driving while intoxicated or falling asleep at the wheel remain a serious problem. After distracted driving, speeding and failure to yield are also major causes of serious car accidents. In these cases, negligence can usually be clearly established if the other driver was driving safely and abiding by the rules of the road. 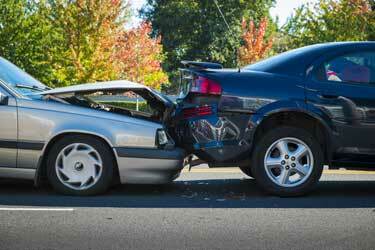 Olson Law Firm represents injured parties in traffic accident claims. We ensure that our clients get fair compensation for their injuries. If you’ve been injured by someone else’s negligence, they are responsible for covering your damages. Give us a call or talk to us online to set up an appointment today.